My question to the Good Dog Blog – a response! I submitted this question months ago and was pleasantly surprised to find a response! 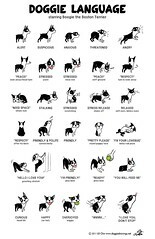 My Dog Is Unpredictable and Has Aggression Problems » Good Dog Blog. The idea is to associate the Scary Monster (people, dogs, etc.) with something good, so that your dog’s emotions change. I hesitate to tell you too much here, because the devil is in the details. It’s really important to get the order of events and timing right with counter-conditioning. But it looks like this: Dog sees the Scary Monster (usually far away), dog gets treats, Scary Monster leaves (or dog does), treats stop. The treats should be extremely special, not regular dog food but cheesy, meaty, peanut-buttery excellence. I did in fact try this ‘technique’ on several of our walks. Whenever another dog appeared in our field of vision, I would give Boogie a treat. Boogie was so focused on the treat that the other dog/Scary Monster became a non-issue. After several days, I noticed that he stopped reacting to other dogs. The part that bothers me is the advice about throwing out the ‘prong collar’ … Honestly I hate the collar and would prefer not to use it, but it works for the leash-pulling business. It works to get the “NO” message across to a very stubborn Boogie. Sure, it may be a short-term superficial solution but without it, we have mayhem. Entry filed under: Articles, links, BAT sessions, Social stuff, Training. Timing is everything when it comes to counter conditioning. Using a clicker speeds up results significantly. You should not have to use a prong or a slip collar. Punishment can come in other forms that are more effective and not harmful to the body, such as droppiing like an anchor if the dog pulls. Thanks for your comment, Andre! I have zero experience with a clicker. Right now there is already an overwhelming amount of information I am trying to take in and put into practice. You are right about timing. I definitely need to work on my timing.